Does the use of a cloud DNS service perform well enough to replace traditional DNS? Does the use of a cloud DNS service create additional connection errors? The experiment generated over a billion DoH transactions and is now closed. You can continue to manually enable DoH on your copy of Firefox Nightly if you like. See the bottom of the original announcement for instructions. 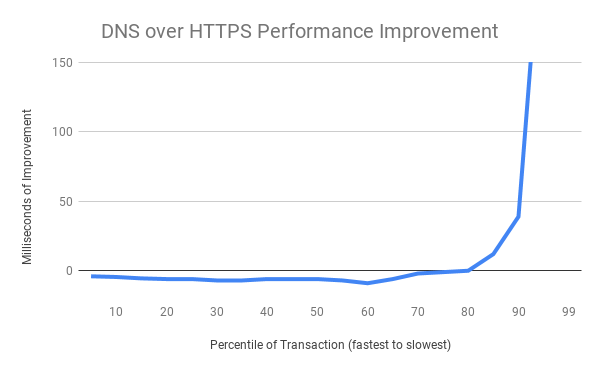 Using HTTPS with a cloud service provider had only a minor performance impact on the majority of non-cached DNS queries as compared to traditional DNS. Most queries were around 6 milliseconds slower, which is an acceptable cost for the benefits of securing the data. However, the slowest DNS transactions performed much better with the new DoH based system than the traditional one – sometimes hundreds of milliseconds better. The above chart shows the net improvement of the DoH performance distribution vs the traditional DNS performance distribution. The fastest DNS exchanges are at the left of the chart and the slowest at the right. The slowest 20% of DNS exchanges are radically improved (improvements of several seconds are truncated for chart formatting reasons at the extreme), while the majority of exchanges exhibit a small tolerable amount of overhead when using a cloud service. This is a good result. We hypothesize the improvements at the tail of the distribution are derived from 2 advantages DoH has compared to traditional DNS. First, is the consistency of the service operation – when dealing with thousands of different operating system defined resolvers there are surely some that are overloaded, unmaintained, or forwarded to strange locations. Second, HTTP’s use of modern loss recovery and congestion control allow it to better operate on very busy or low quality networks. The experiment also considered connection error rates and found that users using the DoH cloud service in ‘soft-fail’ mode experienced no statistically significant different rate of connection errors than users in a control group using traditional DNS. Soft-fail mode primarily uses DoH, but it will fallback to traditional DNS when a name does not resolve correctly or when a connection to the DoH provided address fails. The connection error rate measures whether an HTTP channel can be successfully established from a name and therefore incorporates the fallbacks into its measurements. These fallbacks are needed to ensure seamless operation in the presence of firewalled services and captive portals. We’re committed long term to building a larger ecosystem of trusted DoH providers that live up to a high standard of data handling. We’re also working on privacy preserving ways of dividing the DNS transactions between a set of providers, and/or partnering with servers geographically. Future experiments will likely reflect this work as we continue to move towards a future with secured DNS deployed for all of our users. It looks promising. However, Firefox in my system (openSUSE Tumblweed) crashes now and then after enabling TRR in about:config. I spent a lot of time to find out that the crashing stopped after disabling TRR. I am wondering is there any report on similar issue. Surely it’s only really secure if DNSSEC is involved? In the case of cloudflare as the DoH Server, the Cloudflare recursive does full DNSSEC validation.. and because we have https between the validator and the browser we can transitively trust that. shows that yes, I use only one CloudFlare DNS without any leak. But I’m not sure how constant is this IP. How does this affect the hosts file? Nice diagramm 😉 80 % have a improvement lower than zero. Ooooh, the answer is received before the ask beamed … Big brother is thinking you. 6ms of extra delay seems a very good result indeed. I’m curious about the experimental details. Does DoH transactions you collect include the TLS handshake (which can be several round-trips)? Or, multiple requests use the same connection and only the application data exchange is counted? What about the performance impact of the servers themselves? For example, what is the hardware use for responding to 1,000 DNS queries/second vs 1,000 DoH queries/second?